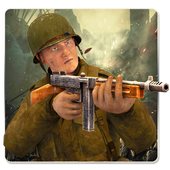 “Call Of World War 2 WW2 : FPS Front line Shooter” is a First person shooting game which is full of action and you experience what was look like in World War 2 (WW2) and how these commandos laid their lives to proclaim peace for the world. This WW2 Game contains a story mode, in which you have complete 15 different missions. Every mission is very sensitive, and you have to complete each one to move on the next one. The difficulty increases with every mission, so be careful and read the objectives of the mission carefully.